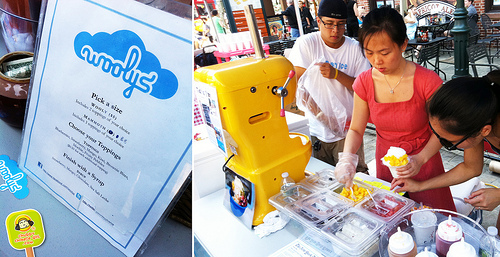 Wooly’s is a mix of Hawaiian and Taiwanese shaved ice. A couple cousins got together and started this sweet icy stand. Their toppings are more Pinkberry-ish than traditional Taiwanese ones. No red bean, grass jelly here. Just fruit, mochi, brownies and fruity pebbles. What sets them apart is the ice itself. 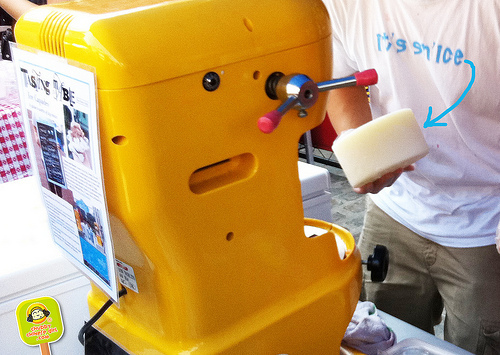 Instead of using the traditional regular ice, they use a homemade condensed milk flavored ice base. The machine then shaves it into nice fluffy snow ice. There’s no store, so I’ve been following them on facebook and twitter all summer. Finally was able to try them a couple weeks ago at the South Street Seaport Food Truck galore. They are usually by City Hall on weekdays and Dekalb Market on weekends. I topped mine with ripe mangos, mochi and drizzled Sea Salt Leche (fancy for salted condense milk). Sooo good!!! The best shaved ice I’ve had in the city, by far. The ice is so fluffed up and light, all that milkyness just melts in your mouth. Like milky snow. 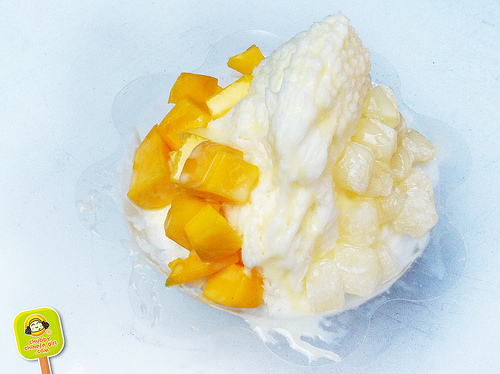 I loved the mochi, mango and that hint of salt from the leche on top, but honestly even without any toppings, the ice itself would satisfy me on any hot summer day. This was the Wolly for $5. Next time, imma get myself the Mammoth size for $8! My only suggestion would be adding some more topping options or the more traditional ones, like egg pudding, red bean, grass jelly or something with green tea for us folks who grew up with this stuff. But then again, I don’t want to mess up a good thing, I’m perfectly content with this as is! Has been serving the Hester Street Fair crowd for a while now. The owner saw a need that wasn’t met in Manhattan and decided to bring what the grew up with in Asia and Flushing to NYC. Extra points for the traditional toppings, along with the more modern ones. For $6 bucks, I got more toppings than Wooly’s. 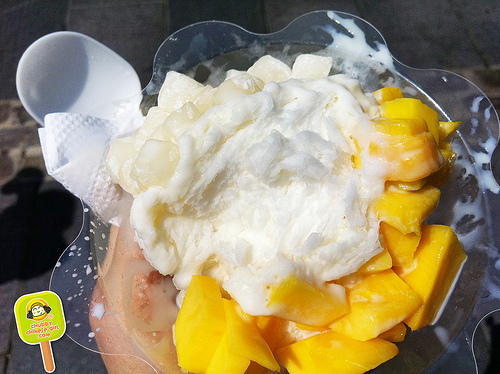 Mango, sweet red bean, grass jelly and a scoop of green tea ice cream, topped with condensed milk. Looking at it, I was as excited as ever, but one spoonful and the ice completely failed the tongue. It wasn’t fluffy or snowy at all, instead it had a bit of a crunch, sort of rough. The toppings were great and the ice cream added that creamy, double freeze feel. Since it uses regular ice blocks for the base, once the outer layer was conquered, the middle was left to be more bland and watery. very informative review! this dessert might be perfect ice cream alternative for me since i'm lactose intolerant! 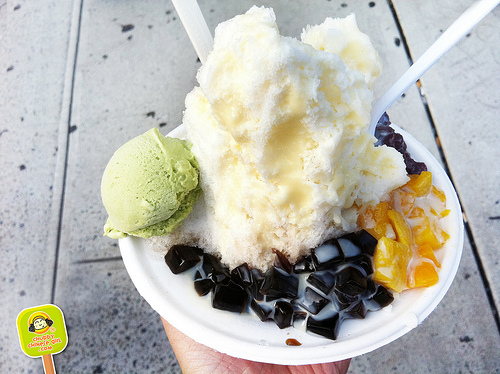 just discovered shaved ice here in LA – when i'm in NYC i'll have to hit these places! Just found your blog. Love it. I'm from Hawaii and my mom's from Taiwan, so shave ice is near and dear to my heart. Lucky you have options in NY. It's seriously lacking here in San Diego. Can't wait to have more in Hawaii this winter.